“Son, brother, father, lover, friend. There is room in the heart for all the affections, as there is room in heaven for all the stars,” wrote Victor Hugo. Today’s post features a bright constellation of books recommended by Mike Duncan, Randy Kinnard, Brent Moody, Gary Shockley and me for Father’s Day – and beyond. I have rarely been so transported, so unexpectedly. It is hard to understand how a novella can give you the same feeling that you have looking out over the Grand Canyon or walking beside a great stormy sea: awe. I felt in awe of the world so beautifully, lovingly, achingly rendered by Maclean – the world itself, and his artistry. I was chatting by email with Adam Ross, editor of The Sewanee Review, and asked if he’d read it. “I’ve never forgotten that book’s fundamental and inescapable truth: that you can’t help someone who doesn’t want it. It touched me deeply,” he replied. So there’s that too, amidst the beauty and the love, the humor, the bottles of beer kept cold under rocks in the flowing river, the sunlight on the water. Mendenhall’s collection of essays – compiled in a slim, attractive 75-page paperback – also moves the mind and spirit. In the first essay, Mendenhall and his brother receive their comeuppance after intentionally disturbing a nest of yellow jackets. In subsequent pieces, Mendenhall describes his youthful diagnosis of cancer (he recovers), his time spent teaching literature classes in a men’s prison, and his grandfather’s reminiscences about Harper Lee. He’s a true Southerner, of a certain sort: one who thinks incessantly about death, the past, and his place in the world. His grandmother took him to the cemetery instead of the playground, for what she called “preparations.” On Sunday mornings before church, his father always made his siblings and him read from the obituaries. Mortality may haunt him, but Mendenhall looks Death in the eye with a smile and a sigh. 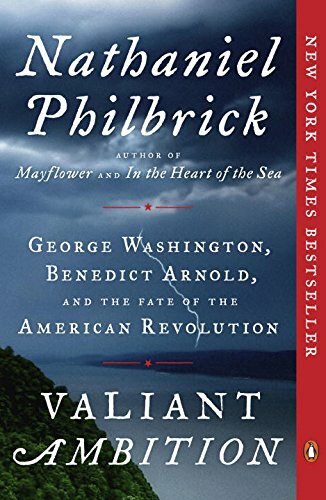 Randy says: Author Nathaniel Philbrick has the rare ability to write history like a novelist. Valiant Ambition kept me intrigued all the way through the epilogue. I had no idea how dedicated Benedict Arnold was to America, how much he suffered in war for us, and how huge a hero he was to his fellow Patriots – before he turned traitor. For several years of the war, Arnold was a true Patriot in the American cause. And not just in words, but through heroic action. He was George Washington’s favorite general, fighting the British with his hands when he had to. He deliberately exposed himself to enemy fire to inspire his troops in battle. Once he caught a round in his left leg, and his femur was shattered. He refused to let the doctor amputate his leg. Even limited physically by his wound, he continued to fight and lead troops. What happened to eventually “turn” Arnold into a traitor? Philbrick tells it. Greed, pride and envy were some of the reasons. But Philbrick concludes that a main reason Arnold went to the other side was his wife Peggy, daughter of a loyalist. As a ruse, she wrote innocuous-seeming letters to British contacts about ordinary, daily things, leaving enough space between the lines so Arnold could write his treacherous, secret messages in invisible ink to his co-conspirators. By the time Arnold decided to betray his country, there was so much rancor and disagreement among Americans that divisiveness threatened certain defeat for the revolutionists. (Sound familiar? Think Vietnam War.) By attempting to sell to the British the key garrison at West Point, New York, and getting discovered in the process, Arnold ironically ended up being the catalyst to pull a divided America together. With the discovery of what traitor Arnold had attempted to do for money, according to Philbrick, at last America had its “antagonist-to-hate.” In a strange twist of fate, Arnold finally united the states, allowing them to go on to win the war. Mike says: Martin Bennett has researched and written a remarkable true story revolving around the Japanese pilot who led the air attack on Pearl Harbor on December 7, 1941. Bennett became intrigued with the story several years ago and was struck with its drama and the fact that it had not – for the most part – been told. The pilot, Mitsuo Fuchida, was thoroughly schooled in the science and philosophy of the air force of the Empire of Japan. He rapidly rose through the ranks and became the trusted confidante of his military superiors. There are three main stories here: that of the pilot, Fuchida; an American young lady whose parents were missionaries in the Philippines; and an American airman who was part of the Doolittle air raid on Japan, subsequently a Japanese prisoner of war. How these three lives intersected during and after the war is an amazing tale. Fuchida barely survived the war and began to have second thoughts about the Japanese motivation for and execution of the war. He began to search for meaning and purpose in life after all his hopes and dreams were destroyed. This is a very timely book, with many illustrations and previously unpublished photographs, particularly since the 75th anniversary of these events was observed last December. Mike says: In this novel, Abigail Baldwyn finds that the husband she thought died during the Civil War is in fact alive, serving at a fort in the West. Thus she begins a journey with her children to find him. She travels from Tennessee to Independence, Missouri where she joins a westbound wagon train with a band of settlers traveling the Oregon Trail to the Northwest. The group encounters many perils along the way: Indian raids, snakebites, fevers, and much uncertainty, requiring great physical endurance. There are several interesting fellow travelers as you might expect with such hardy pioneers. Abigail protects her children and weathers the rigors as best she can. The challenging nature of the journey across the prairie makes for a captivating view of the landscape as well the dangers and interactions with the other members of the party. Abigail’s husband’s behavior provides great mystery and anticipation. The drama builds throughout the journey and the conclusion allows the reader to finally understand the mystery of the story. At the end of the journey, Abigail finds the trials were worth it. Gary says: All memoirists are unreliable narrators – and none more so than the rock ‘n roll star. Often lost in a haze of drugs, recrimination, and megalomania, real events (and emotions) can be hard to find. Two recent examples of the genre are happy exceptions. Bruce Springsteen’s Born to Run (2016) offers a convincing account of his Italian-Irish childhood in New Jersey and glory days as the leader of the hottest bar band at the Jersey shore. Along with a frank account of his struggles with depression, he accepts responsibility for the failure of his first marriage and shows apparently genuine humility about both his successes and failures. 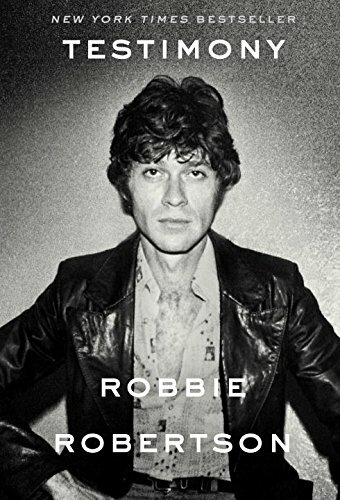 Likewise, Robbie Robertson’s Testimony (2016), starts with an unlikely beginning (Toronto’s Jewish underworld and the Mohawk nation) and ends in stardom. In between, we see 15-year old Robbie riding the Greyhound to Arkansas to join the band of rockabilly wild man Ronnie Hawkins. From there to Levon & the Hawks, Bob Dylan and The Band, Robertson is always entertaining, a natural raconteur. If the ultimate test for a rock ‘n roll memoir is whether the writing approaches the quality of the music, both of these pass. Brent says: Mr. Gonzales’ True Faith and Allegiance embodies two themes coursing through our national dialogue. First, our world changed, perhaps forever, on September 11, 2001. In addition to the political, military and diplomatic implications of the attacks, legal matters had to be considered. How could conventional military rules and regulations and international agreements be applied to an unconventional war and unconventional enemy? While serving in President George W. Bush’s administration as both White House Counsel and then Attorney General, Gonzales played pivotal roles in the early legal matters related to our still ongoing war with terrorists. The conventional rules simply did not apply. The President and his legal advisors forged through these issues, all the while wondering, when is the next attack? Gonzales tells this story in an engaging manner that allows the non-lawyer to understand the overarching legal issues. Many of the matters are still not settled – consider the 4th Amendment implications of surveillance programs designed to thwart threats that are debated to this very day. A second theme, also broad and very human, is Mr. Gonzales’ personal story. It is often said that we are a country of immigrants. Mr. Gonzales exemplifies the best of that ongoing part of our national story. The grandchild of Mexican immigrants, he grew up in a two bedroom house without running hot water. He shared this home with 7 siblings. He describes the influence on his life of a father committed to providing and a dedicated and devoted mother. Against this background, Mr. Gonzales reached the heights of the legal profession: Harvard law and eventually partnership at a prominent Texas law firm. He could have simply made a long and prosperous career as a Texas lawyer. However, an unplanned and unexpected trajectory followed after Mr. Gonzales met George W. Bush. As Mr. Bush became Governor Bush and then President Bush, Mr. Gonzales proved to be a valuable advisor and friend. He assumed critical roles in both the Bush governorship and presidency – a life filled with interesting and challenging work. Mr. Gonzales recounts the series of events that eventually led to his resignation as Attorney General. At this point in Mr. Gonzales’ history, another unfortunate human truth is revealed. On the way up, everybody is your friend; at the bottom, you find out who your true friends really are. After leaving the Attorney General’s office, the normal transition from the highest levels of government service to the highest levels of private enterprise did not await Mr. Gonzales. However, it should be no surprise that a person with the ability go from no running hot water to the highest law enforcement officer in the country will land on his feet. Mr. Gonzales has successfully grown the new law school at Belmont University in Nashville, Tennessee as dean and is now a valuable and sought-after voice on contemporary political matters. Mike Duncan, retired from Franklin Industries, is a serious amateur historian and writer. Many thanks to Shane Neal for the lovely photo of Mike and Kay from our trip to Scotland with a group led by Shane several years ago. Randy Kinnard, a lawyer at Kinnard, Clayton & Beveridge, enjoyed public speaking from an early age. In his spare time, he enjoys the great outdoors and reading history. Brent Moody, a dermatologist and surgeon at Heritage Medical, thinks about politics and American society and paints landscapes. Gary Shockley practices law at Baker Donelson, practices music on the side, and currently finds himself observing a jousting competition with his family in Arezzo, Italy. Many thanks to Hartley Hall for recommending A River Runs Through It when I was enjoying coffee at his and Carolyn’s home (including special guest appearance by Gay Shackelford) not long ago. On Fathers’ Day weekend, I usually pull out James Agee’s Pulitzer Prize winning book “A Death in the Family” and read the prologue – which is a work of art – the prologue (included by the publishers after his death) is called by Agee “Knoxville: Summer, 1915”. There are too many wonderful words in that simple chapter to even describe – I dare anyone to read it and not tear up, especially if you have already lost your father as I have so many years ago. I read it and remember my own summer evenings playing kickball with he neighborhood kids after dinner and a bath, while my parents watered plants in the yard or visited with neighbors doing the same – lightning bugs blinking and heat rising off the pavement. Finally it would be dark and my people would gather me up and take me inside. Blessed to have such wonderful memories. I have kept a book of quotes that I have loved from books that I have read over the years. There are probably a dozen quotes from A River Runs Through It in it. It’s a magnificent little book. Thanks for sharing, Jennifer and gents! What a constellation of books from which to choose from curious, intelligent minds of Nashvilians.